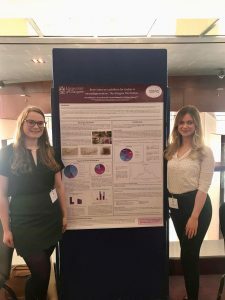 Another great day for GBIRG at the Scottish Dementia Research Consortium (SDRC) this year, with a poster on the TBI archive and the FIELD study, as well as a presentation on the work carried out at GBIRG on TBI pathology by PhD student Hannah Morgan. There were numerous 4 minute flash talks by PhD students during the day, and a variety of posters summarising various large cohorts used in research across Scotland. 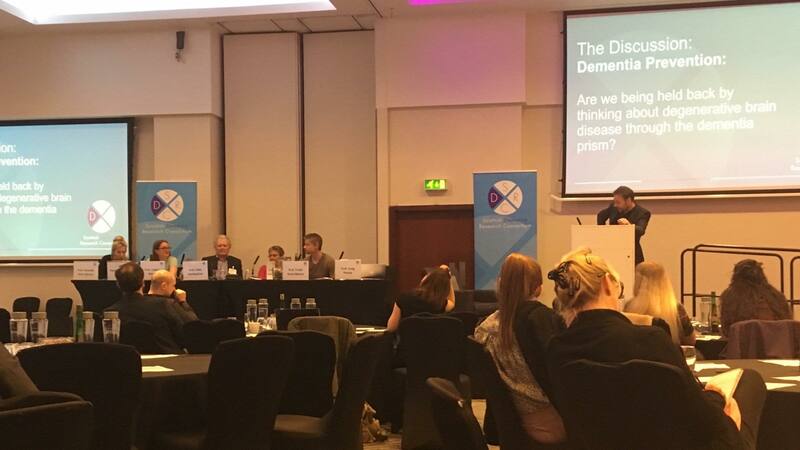 The day ended with a panel discussion about whether thinking about degenerative brain disease through the dementia prism is holding us back, leading to some interesting conversations. We look forward to next year’s conference! 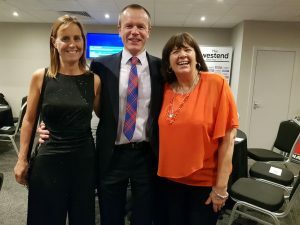 It was fascinating to hear about the work carried out over 6 years by Amanda in her campaign against age discrimination in care, following the diagnosis of her husband – Frank Law, ex-Dundonian footballer, with dementia at the age of 59. 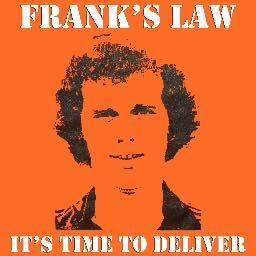 This campaign has resulted in Frank’s Law coming into effect from the 1st April; a law to provide free care to under-65s with degenerative brain diseases including dementia, Parkinson’s and motor neurone disease. We are honoured that she has chosen to support the work carried out by GBIRG and know that this will help with our vital research. 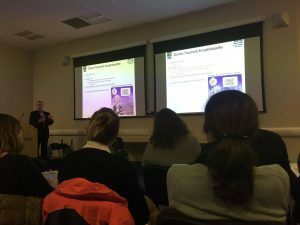 GBIRG were delighted to hold the first Scottish Cognitive Outcomes from Brain Injury Consortium (SCOBIC) meeting at the Queen Elizabeth Hospital on the 17th January, supported by the Scottish Dementia Research Consortium (SDRC) and Alzheimer’s Scotland. 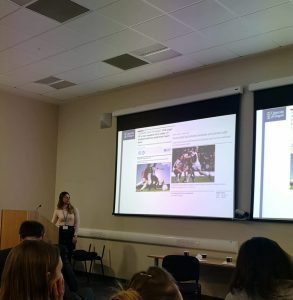 This exciting meeting included sessions on current understanding in brain injury and neurodegeneration, lifelong outcomes after participation in sport, and talks from junior researchers about ongoing research. The conference was chaired by Dr William Stewart, alongside Professor Craig Ritchie, and there were numerous fascinating talks from multiple different research groups, including talks from two of our PhD students; Hannah Morgan and Emma Russell. The conference aimed to start discussions in this area. It was a very successful meeting and we hope to see everyone again at the next one! GBIRG were very excited to meet the founder of Pink Concussions Katherine Snedaker. Pink concussions aim to improve education and awareness about head injury in women and girls. Stay tuned to hear more about our exciting partnership! 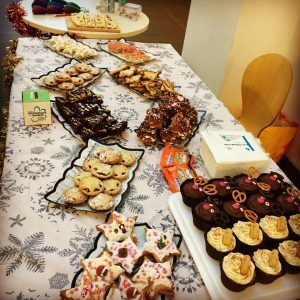 Alzheimer’s Society Elf Day Bake Sale! 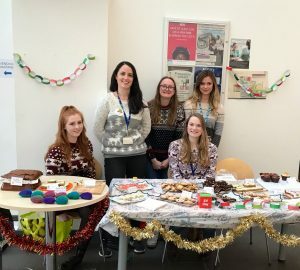 GBIRG’s elves worked hard in the kitchen baking some delicious festive treats to raise money for Alzheimer’s Society. It was a sell out and they managed to raise £262!! Dr Lindsey Forbes has joined as a Postdoctoral Research Assistant. 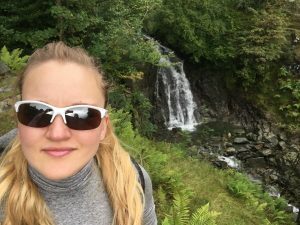 Dr Forbes gained her PhD from the University of St Andrews earlier this year researching stem cell transplantation for repair of the spinal cord after injury. Her research interests lie in understanding the mechanisms that underpin neurodegeneration following injury and disease as well as methods to promote regeneration. The lab attended an exciting and interesting meeting to discuss paediatric research with topics ranging from gene delivery to neurotoxicity and human empathy. Dr Fullerton presented her data on blood-brain barrier disruption following TBI in paediatric patients. There was an inspiring plenary speaker, Professor Solomon Moshe from Albert Einstein Medical School, New York, presenting his interesting research on paediatric epilepsy. Jennifer Hay has passed her PhD viva with minor corrections! We are all so proud of her, and the hard work she has put into her PhD and thesis! Wishing her the all the best for her future aspirations as Dr Hay! Congratulations from us all at the GBIRG! In August, Dr Stewart, Dr Fullerton and Hannah Morgan set off to the beautiful city of Toronto to attend International Neurotrauma Symposium 2018. The diverse program of plenary seminars, speakers, poster and break-out sessions proved to make a inspiring, interesting and informative meeting. 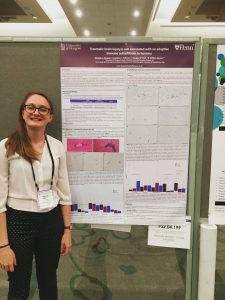 A central focus of INTS were the highly interactive poster sessions, in which Hannah presented her study entitled “Traumatic brain injury is not associated with an adaptive immune cell infiltrate in humans” which attracted a great deal of interest and attention – and she greatly enjoyed the experience! 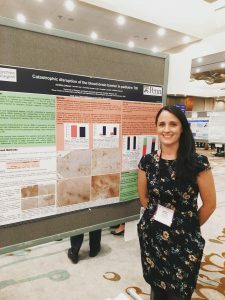 Dr Fullerton’s poster entitled “Catastrophic disruption of the blood-brain barrier in pediatric TBI” was nominated as a top 20 poster competition finalists, and won 1st prize poster award sponsored by the European Brain Consortium – she was thrilled! Overall it was a fantastic meeting, and the GBIRG can’t wait for National Neurotrauma 2019 in Pittsburgh! 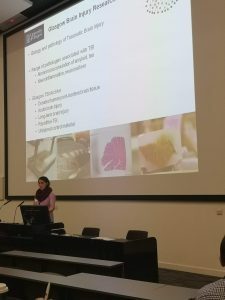 On the 21st August, Dr Fullerton presented her work at the ARUK Scottish Network M eeting in the Byre theater in St Andrews. 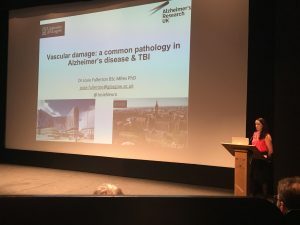 Dr Fullerton discussed her data on the vascular pathologies of traumatic brain injury and how they relate to Alzheimer’s disease; her talk was well received and generated a number of interesting questions and discussions. 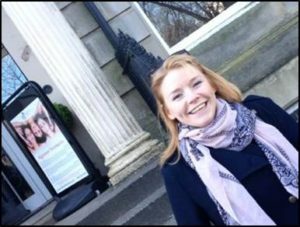 In addition, Dr Fullerton has become ARUK’s Early Career Researcher representative for Glasgow, and will be organising an ECR event with the rest of the panel for the end of November – details to follow! 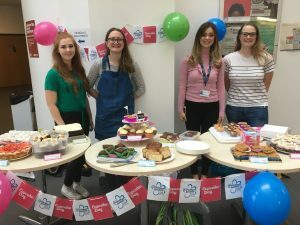 On the 15th June, the GBIRG held a bake sale to raise money for Alzheimer’s Society at the Queen Elizabeth University Hospital. The cakes ranged from Guinness cake to vegan banana cupcakes, and it was a huge success! In just two hours the bake sale raised nearly £300! Thank you very much for your kind donations and support, we look forward to CupcakeDay2019! Dr Fullerton had far too much fun at Pint of Science 2018 at the Raven this month! 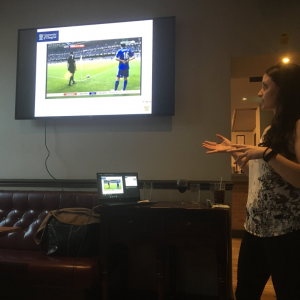 Her presentation ‘Sports concussion & dementia: what to believe?’ brought up some interesting discussion points with a very enthusiastic audience. Surprisingly, 60% of the audience voted to ban heading in youth football, with only 8% voting that we do not have enough evidence! Furthermore, 50% of the audience voted that footballers are at a greater risk of dementia, while 36% stated that more research is required. Dr Fullerton left them with the take home message that more research is definitely required!! Find out when a Pint of Science event is taking place near a you! 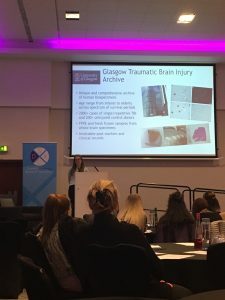 Chloe is a Foundation year 2 Doctor and for her final rotation of her training she has joined the Glasgow Brain injury Research Group to undertake a research project in traumatic brain injury in the elderly. 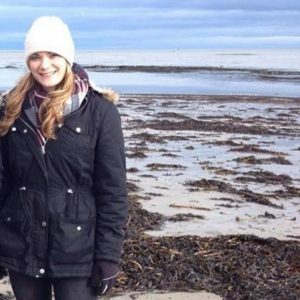 Prior to joining the GBIRG, Chloe completed a BSc (Hons) in Medical Science 2006-2010 and MSc Human Anatomy 2010-2011 at the University of Edinburgh followed by a MBBS medical degree at the Hull York Medical School. She has a special interest in neuroscience with both her science degree dissertation projects in neurodevelopment. Her ambition is to become a paediatric neurosurgeon and she will be starting neurosurgery training in Leeds from August 2018. This April, the GBIRG team attended the SDRC conference at the Radisson Blu hotel in Glasgow. 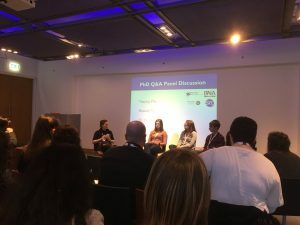 This one-day event strongly focused on collaborative interdisciplinary research, and included 3-minute thesis presentations, posters and early career researcher discussions – and a rather helpful panel discussion! The conference certainly left members of the GBIRG feeling inspired and focused to further investigate the link between traumatic brain injury and neurodegeneration. For further information on the SDRC please check out their website. Our Edinburgh International Science Festival event has been and gone! It was a brilliant night, kicked off with Dr Stewart’s presentation “If 99% of athletes will get degenerative brain disease, is it time to ban contact sports?” and followed by a great panel session with Nuala Deans (British Paralympic Association and ex-Scotland rugby player), Dr Alan Carson (Neuropsychiatrist and lecturer), Dr Geoff Cross (FY1 in medicine and ex-Scotland rugby player) and Peter Robinson (concussion campaigner), the discussion was led by Jamie Lyall, sports journalist from BBC Scotland. The audience posed some fantastic questions to the panel, and we were thrilled with the turn out! The GBIRG are grateful for the support of the Wellcome Institutional Strategic Support Fund which allowed this event to take place. 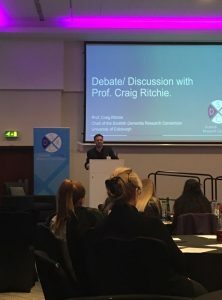 At the Lighthouse in Glasgow, the University of Glasgo w’s Neuroscience Society held their annual Neuroscience Careers Conference. The meeting was well attended, and covered a variety of topics from ‘Challenges of Research’ presented by Dr Fullerton, to a PhD student panel for Q&A session – which included our own PhD student Hannah Morgan. It was a brilliant event, and brought up a great deal of interesting conversation topics and questions. Check out the photos from the event on the Neuroscience Society’s Facebook page! Two weeks to our Edinburgh Science Festival evening event “Get’cha head in the game: Tackling sports concussion”. Tickets are limited, and reported to be selling fast. January marks the start of our study ‘Football’s InfluencE on Lifelong health and Dementia (FIELD)’, which is supported by The Football Association and Professional Footballer’s Association. Given growing anxieties over perceived increased risk of dementia in former professional footballers, establishing robust data on late neurodegenerative outcomes of participation in football is a priority to inform public health policy, and the sport. Importantly, insight into risk of neurodegenerative disease must be read in context of wider lifelong health outcomes to permit adequately informed discussions on the public health implications of football participation. 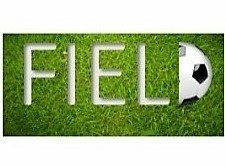 The FIELD Study is designed to investigate a wide range of physical and mental health outcomes, including neurodegenerative disease, in former professional footballers. 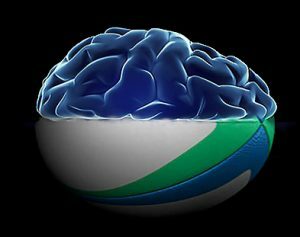 In addition, we are hoping to register as many former athletes exposed to brain injury, including but not restricted to footballers, rugby players and boxers, to our brain donation programme to support ongoing research into degenerative brain disease linked to brain injury. In January, the Glasgow Brain Injury Research Group welcomed John Arena, fellowship student from the University of Pennsylvania, to the lab. During his visit John contributed to ongoing studies in GBIRG and gained experience in working with the Glasgow TBI Archive. 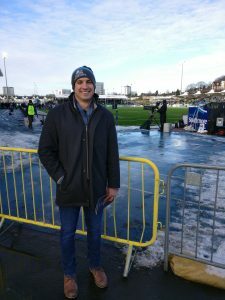 There was also time for a break from bench work to take in a Glasgow Warriors match and see professional rugby first hand. Th e GBIRG are happy to announce that Tess Atkinson has been recruited as our laboratory technician! In 2016, Tess joined the group for a summer internship in Neuropathology, and we are thrilled that she is now a full-time member of our team! 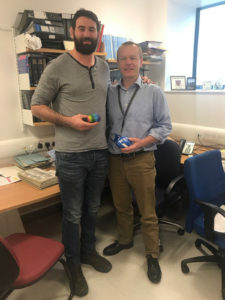 The Glasgow Brain Injury Research Group were delighted to welcome recently retired Pau and Canada rugby player Cameron Pierce of The Rugby Safety Network (RSN) to the lab to discuss concussion in sport, player welfare and our ongoing research. Plans for further discussion and collaboration between GBIRG and RSN are in the pipeline, watch this space for updates. On Friday 10th November, Dr Fullerton presented a talk on ‘Paediatric head injury in the West of Scotland’ at Glasgow Paediatric Research day 2017. 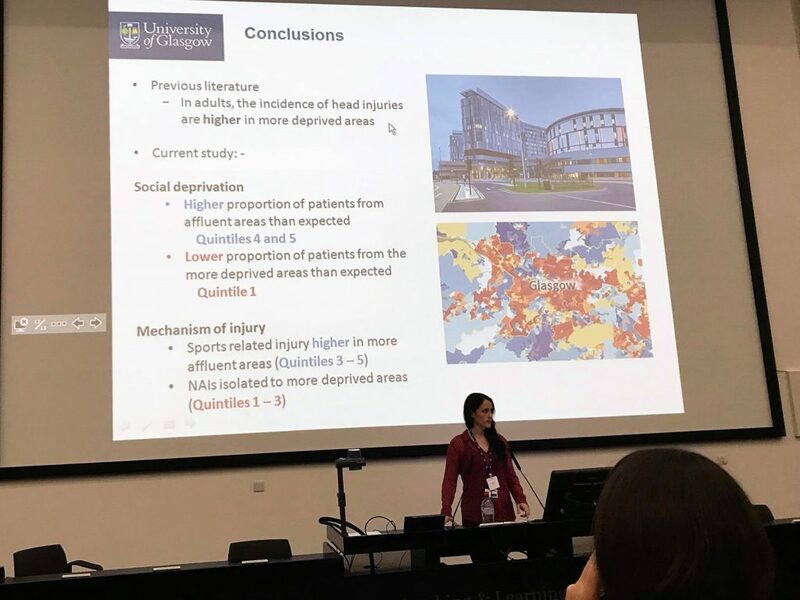 She discussed some surprising data on the distribution of head injury in the West of Scotland and the mechanisms of injury that are involved – and won 1st prize for her presentation! Dr Willie Stewart, Honorary Clinical Associate Professor, Institute of Neuroscience and Psychology, and collaborators at the University of Pennsylvania have been successful in securing funding from Citizens United for Research in Epilepsy (CURE) to support a three year programme of collaborative studies directed towards understanding the ‘Neuropathological mechanisms of epileptogenesis in post-traumatic epilepsy’. 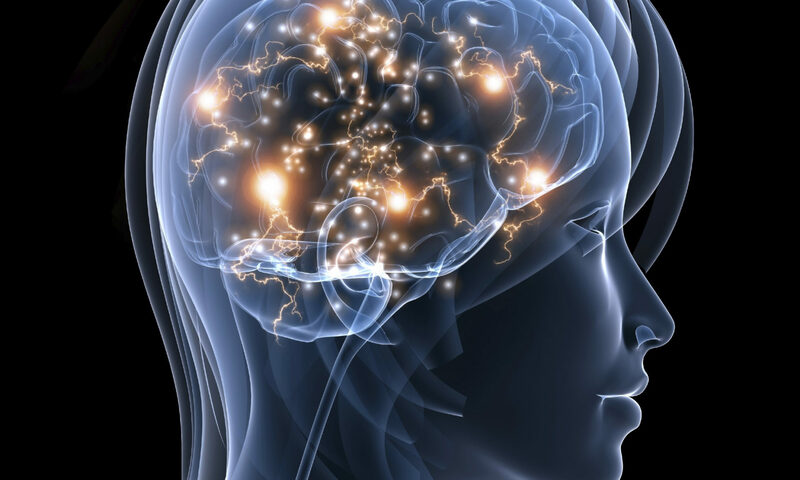 Post-traumatic epilepsy (PTE) represents a frequent and debilitating complication of traumatic brain injury (TBI), and is implicated in an estimated 5% of all epilepsy in the community. In contrast to non-traumatic epilepsy, the neuropathology of PTE remains virtually unreported in the literature. Utilising the unique resources of the Glasgow TBI archive, Dr Stewart and colleagues will coordinate a series of studies intended to characterise the spectrum of pathology in survivors of PTE. 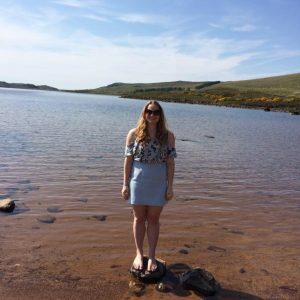 Tess Atkinson recently graduated from Glasgow University with a Masters in Neuroscience and has joined the G.B.I.R.G for a summer Internship. Tess previously worked in the University of Maastricht researching post-traumatic stress disorder and Dr Cobb’s lab at the University of Glasgow researching Rett’s Syndrome. She is particularly interested in the pathology of disease and brain disorders – so she is in the right place! We are happy to have her on board and hope she enjoys her time here! The recent spark in media coverage on the potential link between heading and dementia has dramatically increased public interest, but has left a number of unanswered questions. The recently published editorial ‘Heading for trouble: is dementia a game changer for football?’discusses the current position of science on heading, and the link between football, dementia and CTE. 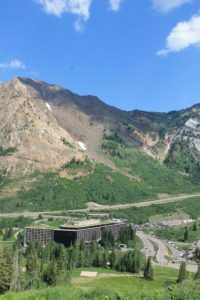 At almost 8,000ft above sea level Dr Stewart and Dr Fullerton attended the National Neurotrauma Society symposium in Snowbird, Utah. NNS put together an exciting symposium comprised of plenary seminars and break-out sessions where world leading experts shared their opinions, most recent research and findings on neurotrauma. 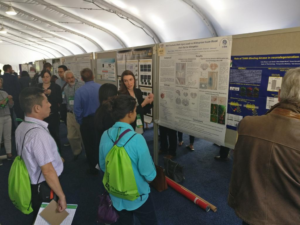 A central focus of Neurotrauma 2017 was the highly interactive poster sessions, in which Dr Fullerton presented her poster “Traumatic brain injury survival is associated with widespread cerebral amyloid angiopathy”. The innovative workshops covered pivotal topics fro m writing effective publications and grants to improving scientific communication. 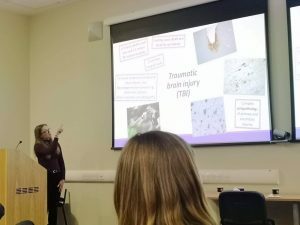 Dr Stewart held a successful workshop on Human TBI Neuropathology which stimulated discussions on the mechanisms, histology and assessment of chronic traumatic encephalopathy (CTE). 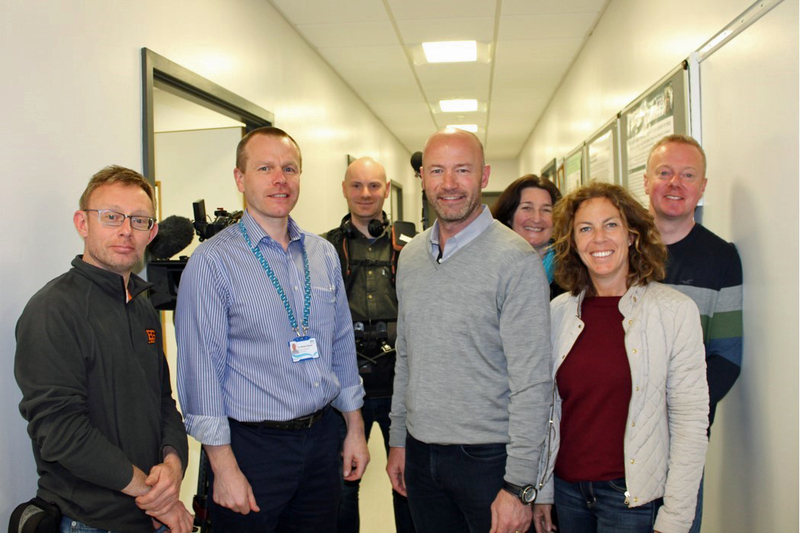 Former England captain, Alan Shearer visited the Queen Elizabeth University Hospital to film his BBC One documentary on research linking football and dementia. The ex-Newcastle and Blackburn striker interviewed Dr Willie Stewart in a bid to find out if footballers are more at risk from suffering dementia in later life. After a tour around the lab, Shearer and Dr Stewart discussed topics from chronic traumatic encephalopathy (CTE) and concussion, to research priorities in sports traumatic brain injury (TBI) and outcomes for players. 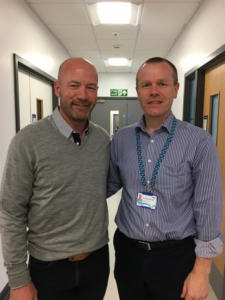 Without giving too much away, Shearer’s BBC One documentary ‘Dementia: Football’s Silent Shame?’ will be aired late summer. Institute of Neuroscience and Psychology Honorary Clinical Associate Professor Dr Willie Stewart and collaborators at the University of Pennsylvania have been successful in securing funding from the US National Institute of Neurological Disorders and Stroke to support a five year programme of multi-centre collaborative studies directed towards the Neuropathological Characterization of ‘CTE’ (Chronic Traumatic Encephalopathy). 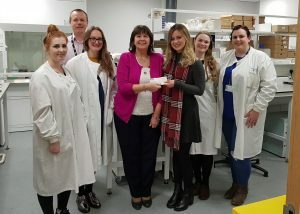 They have also been awarded funding to continue their ongoing research programme titled ‘TBI (traumatic brain injury) and Amyloid-Beta Pathologies’ for a further five years. In these ongoing studies, Dr Stewart’s lab will explore pathways contributing to amyloid genesis and clearance after TBI, in particular, the contribution of vascular pathology to post-TBI neurodegeneration.